Pro Football Focus’ in-depth charting and advanced stats look beyond the box score to identify key metrics otherwise overlooked across all positions in the NFL. This “Signature Stat Spotlight” series will walk readers through the varying advanced stats and metrics we track for every player at every position in every game. Below, I’ve taken a deep dive into the running back position. In addition to grading all of the NFL’s running backs via our advanced grading process, PFF tracks forced missed tackles, yards after contact, elusive rating and breakaway percentage in Premium Stats 2.0, our advanced statistics database made available to all of our ELITE subscribers. I’ll also highlight some advanced stats we can pull from other sources behind the scenes at PFF that we sometimes reference in articles. 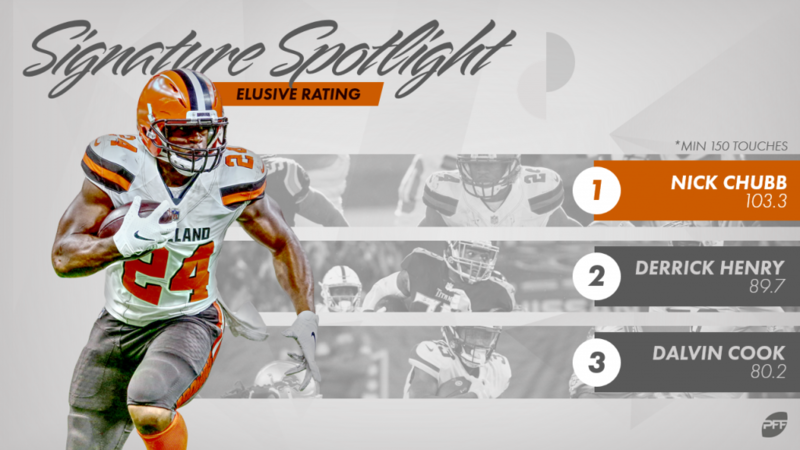 PFF’s elusive rating, which pulls carries, receptions, forced missed tackles and yards after contact into a formula to calculate a rating similar to passer rating, is meant to illustrate a running back’s elusiveness in a singular number. The formula: (Forced Missed Tackles) / (Carries + Receptions) * (Yards After Contact per Attempt * 100). No back was more elusive on a per-touch basis than Cleveland Browns rookie Nick Chubb in 2018. Among the 38 NFL backs with 150-plus touches on the year, Chubb ranked first in PFF’s elusive rating at 103.3. Leading the group in yards after contact per attempt (4.47) and ranking tied for third in forced missed tackles per touch (0.231) will do that. Plays like the one below will drive any back’s elusive rating through the roof, especially if backs can produce such plays consistently. Here, Chubb breaks away from the first contact made by Oakland Raiders linebacker Marquel Lee (No. 55). He then gets back up to full speed quickly and forces a whiff from safety Erik Harris in the open field to break free for a long touchdown run. He demonstrates great contact balance, acceleration, vision and, of course, elusiveness all on one play. The play above also serves as a good segue way to discuss breakaway percentage. When a running back gains 15-plus yards on a single run, PFF tracks the run as a breakaway run and all the yards gained as breakaway yards. Then, we divide all of the running back’s breakaway yards by their total yards to calculate a back’s breakaway percentage and show which runners earn the highest (and lowest) percentage of yards on big runs. In 2018, New York Giants’ Saquon Barkley led all 47 NFL running backs with 100-plus carries in breakaway percentage at 54.0%. As such, his rushing production was largely influenced by his ability to break off long runs. He gained 54.0% of his 1,307 rushing yards on the 20 carries he took for 15-plus yards in 2018. Barkley flashed his big-play ability here against the Jacksonville Jaguars’ defense. He breaks two tackles near the line of scrimmage before bouncing the run outside and speeding down the sideline for a long touchdown. On the opposite end of the spectrum, Green Bay Packers’ Jamaal Williams ranked dead last in breakaway percentage (11.6%) among the 47 backs with 100-plus carries this season. He was quite the opposite of a big play waiting to happen and relied on down-to-down consistency to have high-end single-game performances. He took just three carries for 15-plus yards this past season, leading to just 54 breakaway yards. In today’s NFL, catching the ball is just as important if not more important for running backs, so we also track receiving success for backs using the same advanced stats for tight ends and wide receivers (i.e., yards per route run, passer rating when targeted, YAC/reception, drop rate). We track yards after contact and forced missed tackles on receptions for all pass-catchers, as well. Finishing as the second-most valuable running back per PFF’s WAR metric (1.44), Chicago Bears’ Tarik Cohen is a prime example of an NFL back with high-end successes across nearly all of our advanced receiving stats. He led all qualifying backs in yards per route run (2.37), logged just one drop and recorded an impressive 111.0 passer rating when targeted. Here, Cohen beats Giants’ Grant Haley on an out-and-up down the right sideline for a long gain, flashing great quickness and route-running ability out of the backfield. In addition to advanced stats shown in Premium Stats 2.0, we chart intended point of attack, the actual point of attack, yards before first contact and run concept (i.e., power, outside zone, inside zone). PFF’s point of attack charting can reveal back’s both at the NFL and college level who tend to bounce runs away from the intended hole for the play. Yards before first contact is a great figure to take into account when evaluating a running back’s vision and the success of the offensive line of ahead of him. Denver Broncos rookie Phillip Lindsay led the NFL in yards before first contact per attempt (3.05) and percentage of yards gained before first contact (56.5%) in 2018, a testament to his ability to avoid contact at the line of scrimmage and the success of the Broncos’ big men up front. Lindsay shows great patience and takes advantage of some nice blocks here against the Los Angeles Chargers for an untouched 41-yard touchdown run. To continue to learn more about PFF’s advanced stats, please stay tuned for the rest of our Signature Stat Spotlight Series. Or, better yet, subscribe to PFF’s ELITE subscription to dive into the numbers yourself throughout the offseason and into next season.